Crew and passengers use oxygen systems, in conjunction with pressurization systems, to prevent hypoxia. Regulations require, at a minimum, flight crews have and use supplemental oxygen after 30 minutes exposure to cabin pressure altitudes between 12,500 and 14,000 feet. Use of supplemental oxygen is required immediately upon exposure to cabin pressure altitudes above 14,000 feet. Every aircraft occupant, above 15,000 feet cabin pressure altitude, must have supplemental oxygen. However, based on a person’s physical characteristics and condition, a person may feel the effects of oxygen deprivation at much lower altitudes. Some people flying above 10,000 feet during the day may experience disorientation due to the lack of adequate oxygen. At night, especially when fatigued, these effects may occur as low as 5,000 feet. Therefore, for optimum protection, pilots are encouraged to use supplemental oxygen above 10,000 feet cabin altitude during the day and above 5,000 feet at night. Most high altitude aircraft come equipped with some type of fixed oxygen installation. If the aircraft does not have a fixed installation, portable oxygen equipment must be readily accessible during flight. The portable equipment usually consists of a container, regulator, mask outlet, and pressure gauge. Aircraft oxygen is usually stored in high pressure system containers of 1,800–2,200 psi. When the ambient temperature surrounding an oxygen cylinder decreases, pressure within that cylinder decreases because pressure varies directly with temperature if the volume of a gas remains constant. A drop in the indicated pressure of a supplemental oxygen cylinder may be due to the container being stored in an unheated area of the aircraft rather than an actual depletion of the oxygen supply. High pressure oxygen containers should be marked with the psi tolerance (i.e., 1,800 psi) before filling the container to that pressure. The containers should be supplied with oxygen that meets or exceeds SAE AS8010 (as revised), Aviator’s Breathing Oxygen Purity Standard. To assure safety, periodic inspection and servicing of the oxygen system should be performed. An oxygen system consists of a mask or cannula and a regulator that supplies a flow of oxygen dependent upon cabin altitude. Most regulators approved for use up to 40,000 feet are designed to provide zero percent cylinder oxygen and 100 percent cabin air at cabin altitudes of 8,000 feet or less, with the ratio changing to 100 percent oxygen and zero percent cabin air at approximately 34,000 feet cabin altitude. [Figure 7-43] Most regulators approved up to 45,000 feet are designed to provide 40 percent cylinder oxygen and 60 percent cabin air at lower altitudes, with the ratio changing to 100 percent at the higher altitude. Figure 7-43. 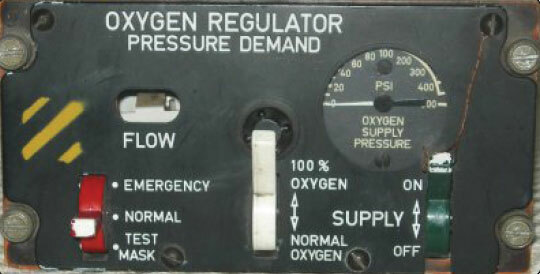 Oxygen system regulator. Pilots should be aware of the danger of fire when using oxygen. Materials that are nearly fireproof in ordinary air may be susceptible to combustion in oxygen. Oils and greases may ignite if exposed to oxygen and cannot be used for sealing the valves and fittings of oxygen equipment. Smoking during any kind of oxygen equipment use is prohibited. Before each flight, the pilot should thoroughly inspect and test all oxygen equipment. The inspection should include a thorough examination of the aircraft oxygen equipment, including available supply, an operational check of the system, and assurance that the supplemental oxygen is readily accessible. The inspection should be accomplished with clean hands and should include a visual inspection of the mask and tubing for tears, cracks, or deterioration; the regulator for valve and lever condition and positions; oxygen quantity; and the location and functioning of oxygen pressure gauges, flow indicators, and connections. The mask should be donned and the system should be tested. After any oxygen use, verify that all components and valves are shut off. There are numerous types and designs of oxygen masks in use. The most important factor in oxygen mask use is to ensure that the masks and oxygen system are compatible. Crew masks are fitted to the user’s face with a minimum of leakage and usually contain a microphone. Most masks are the oronasal type that covers only the mouth and nose. A passenger mask may be a simple, cup-shaped rubber molding sufficiently flexible to obviate individual fitting. It may have a simple elastic head strap or the passenger may hold it to his or her face. All oxygen masks should be kept clean to reduce the danger of infection and prolong the life of the mask. To clean the mask, wash it with a mild soap and water solution and rinse it with clear water. If a microphone is installed, use a clean swab, instead of running water, to wipe off the soapy solution. The mask should also be disinfected. A gauze pad that has been soaked in a water solution of Merthiolate can be used to swab out the mask. This solution used should contain one-fifth teaspoon of Merthiolate per quart of water. Wipe the mask with a clean cloth and air dry. A cannula is an ergonomic piece of plastic tubing that runs under the nose to administer oxygen to the user. [Figure 7-44] Cannulas are typically more comfortable than masks, but may not provide an adequate flow of oxygen as reliably as masks when operating at higher altitudes. Airplanes certified to older regulations had cannulas installed with an on-board oxygen system. However, current regulations require aircraft with oxygen systems installed and certified for operations above 18,000 feet to be equipped with oxygen masks instead of cannulas. Many cannulas have a flow meter in the oxygen supply line. If equipped, a periodic check of the green flow detector should be a part of the pilot’s regular scan. Figure 7-44. Cannula with green flow detector. Diluter-demand oxygen systems supply oxygen only when the user inhales through the mask. An automix lever allows the regulators to automatically mix cabin air and oxygen or supply 100 percent oxygen, depending on the altitude. 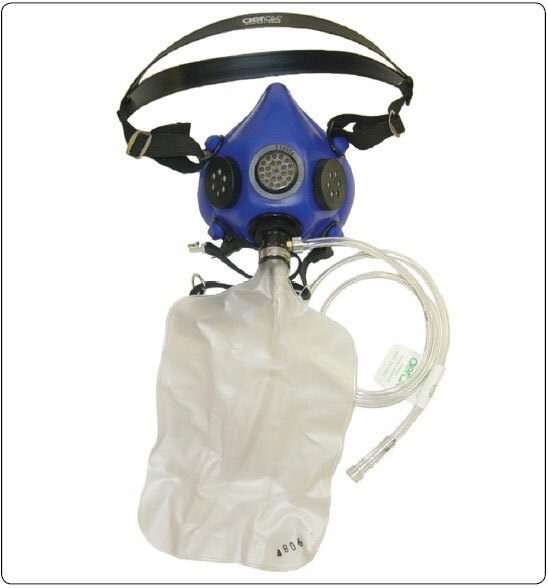 The demand mask provides a tight seal over the face to prevent dilution with outside air and can be used safely up to 40,000 feet. A pilot who has a beard or mustache should be sure it is trimmed in a manner that will not interfere with the sealing of the oxygen mask. The fit of the mask around the beard or mustache should be checked on the ground for proper sealing. Pressure-demand oxygen systems are similar to diluter demand oxygen equipment, except that oxygen is supplied to the mask under pressure at cabin altitudes above 34,000 feet. Pressure-demand regulators create airtight and oxygen-tight seals, but they also provide a positive pressure application of oxygen to the mask face piece that allows the user’s lungs to be pressurized with oxygen. This feature makes pressure demand regulators safe at altitudes above 40,000 feet. Some systems may have a pressure demand mask with the regulator attached directly to the mask, rather than mounted on the instrument panel or other area within the flight deck. 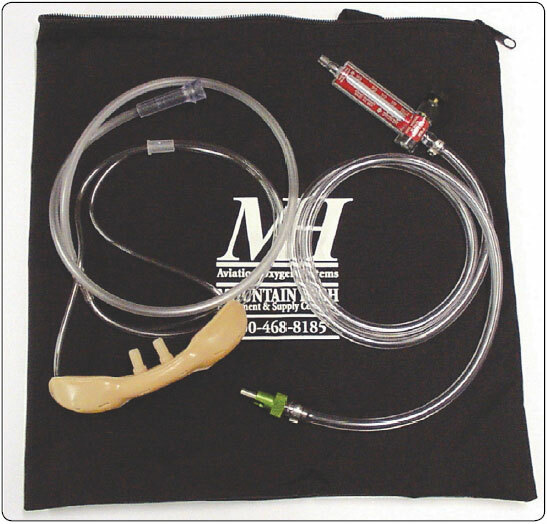 The mask-mounted regulator eliminates the problem of a long hose that must be purged of air before 100 percent oxygen begins flowing into the mask. Figure 7-45. Continuous flow mask and rebreather bag. Figure 7-46. 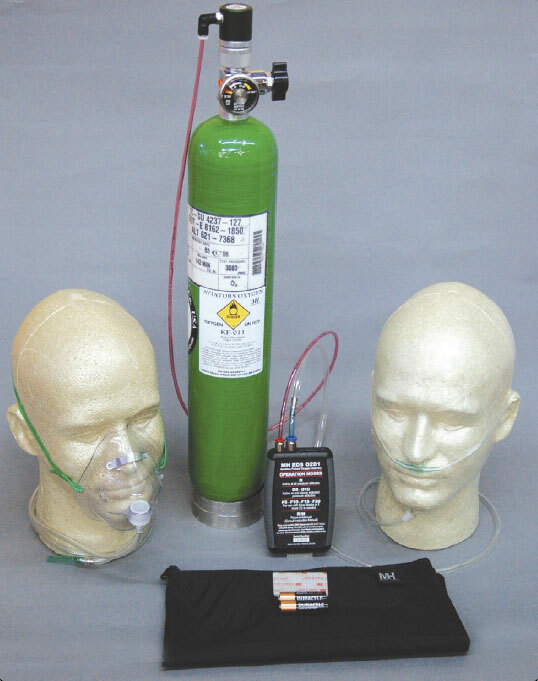 EDS-011 portable pulse-demand oxygen system. Figure 7-47. 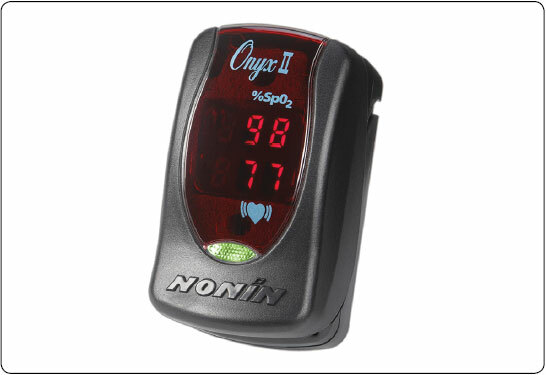 Onyx pulse oximeter. Before servicing any aircraft with oxygen, consult the specific aircraft service manual to determine the type of equipment required and procedures to be used. Certain precautions should be observed whenever aircraft oxygen systems are to be serviced. Oxygen system servicing should be accomplished only when the aircraft is located outside of the hangars. Personal cleanliness and good housekeeping are imperative when working with oxygen. Oxygen under pressure creates spontaneous results when brought in contact with petroleum products. Service people should be certain to wash dirt, oil, and grease (including lip salves and hair oil) from their hands before working around oxygen equipment. It is also essential that clothing and tools are free of oil, grease, and dirt. Aircraft with permanently installed oxygen tanks usually require two persons to accomplish servicing of the system. One should be stationed at the service equipment control valves, and the other stationed where he or she can observe the aircraft system pressure gauges. Oxygen system servicing is not recommended during aircraft fueling operations or while other work is performed that could provide a source of ignition. Oxygen system servicing while passengers are on board the aircraft is not recommended.